When someone talks about Tennis in India, Sania's name will come to our mind. In fact, Sania Mirza is a well-known sportsperson for all the people in South Asia who follow Tennis. Sania married Pakistan cricketer Shoaib Malik in 2010. The news of Sania's pregnancy broke out recently. Sania.. Shoaib have posed for several photos in the past but their latest photograph is something special. 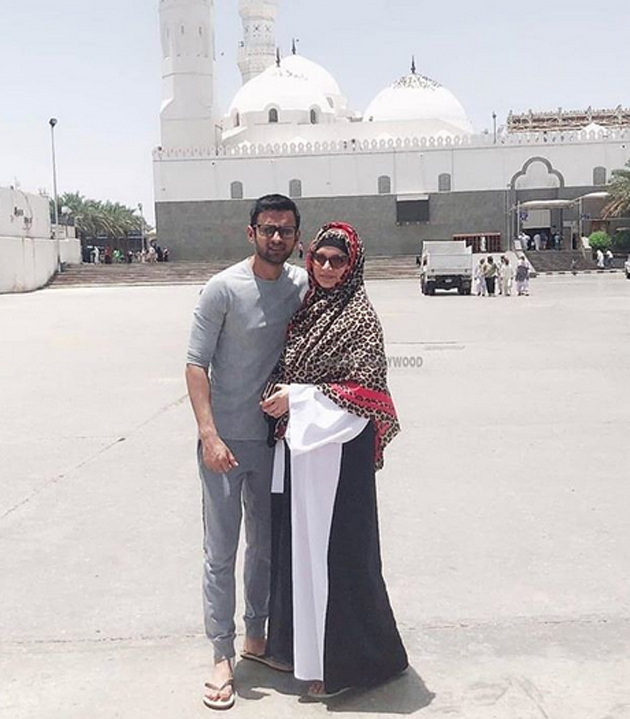 The couple went on Umrah visit along with their parents before the start of Ramzan festival. Sania appeared in traditional costumes in the photo. While Sania appeared in traditional attire along with headscarf, Shoaib appeared in a casual dress wearing jeans and a white T-shirt. The pics of their Umrah trip have gone viral as they have posted them on the social media. Shoaib was casual in one pic but he is also seen wrapping a traditional white cloth along with Sania, Sania's father. The traditional appearance of Sania has generated a lot of buzz in the social media.